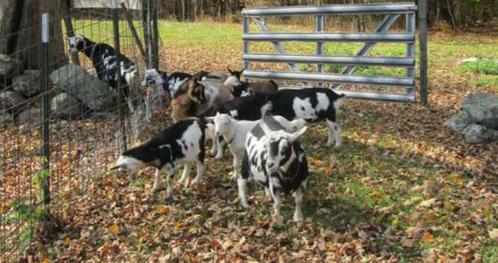 Woody End Farm and Altomar Nigerian Dwarf Goats. After 15 years away from raising goats, we're back raising Nigerian Dwarf Goats. We chose the breed because it was small but had an excellent reputation for milk production. We have found them to have wonderful personalities, excellent milk producers, and they adore browsing and have done and excellent job of clearing our stonewalls and pastures. We currently have bucks, and does from excellent registered milk production lines for sale. If interested, please contact us at 978-874-2471 or altobelliml260@comcast.net.